36 • WRAPS • 2 0 1 8 THE ART OF THE OVERLAY PRODUCTION & INSTALLATION ANOTHER COMMON OVERLAY So let's talk about another very common overlay I use all the time to achieve a wrap-around look on the front of any vehicle. 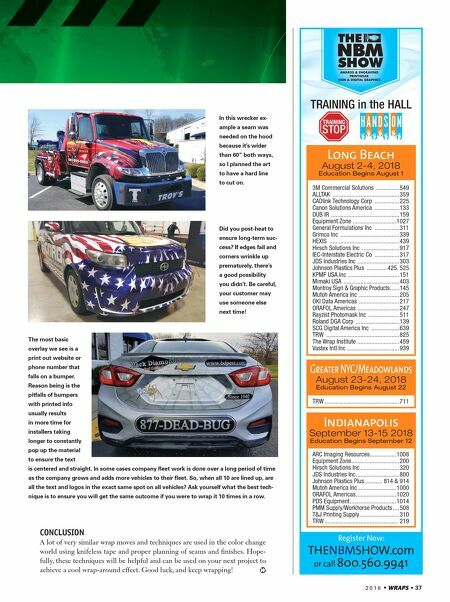 Two basic steps are involved: • Step 1—Use a solid color or digital print pattern for the entire bumper wrap that you will install rst. • Step 2—When the side is installed it is usually trimmed on a hard line of the kit that will lay over onto the bumper that you just wrapped. Sometimes you have to dry t the wrap so you can see the fend- er to make sure you cut the excess kit that falls onto the bumper. This can be done more safely by doing a pre-cut after you dry t. In both examples, the bumper was wrapped blue first, and then the sides overlay onto the bumper. Follow the curve of the graphic to trim the side piece, and use a hard line to have a cleaner seam that's hidden. Now cut out the graphic on the line you traced, and mirror trace it on the driver's-side print. 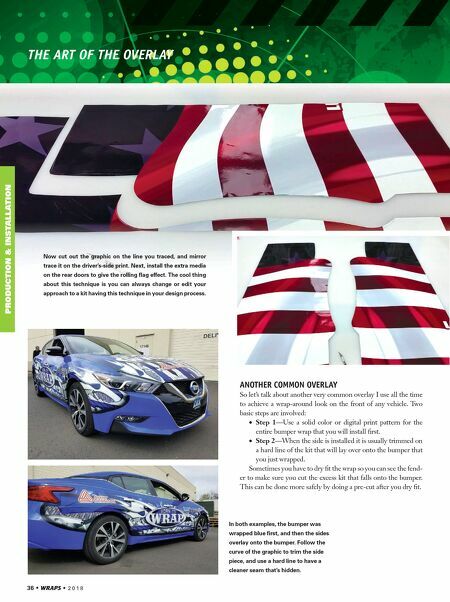 Next, install the extra media on the rear doors to give the rolling flag effect. The cool thing about this technique is you can always change or edit your approach to a kit having this technique in your design process.